I know, I know. It’s not Saturday and I’m posting free patterns. 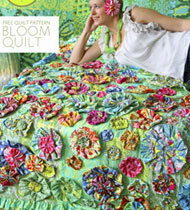 I couldn’t help it though — with patterns this cute it makes me wish I had the time to get back to quilting. In preparing for the arrival of Baby Girl, my sewing studio — studio sounds so much more professional and productive than room, doesn’t it?! — was relocated. Before it shared space with our guest room, vying for what little free area it could grab. There was an old desk that I used to set a machine on. A single machine. So I was constantly rotating my sewing machine and serger when I needed them. All of my sewing supplies were tucked into drawers of the desk or stuck in containers on a shelf that overflowed in the corner. When we began talking about where we were going to put a nursery, it became evident that the best choice was the guest/sewing room. 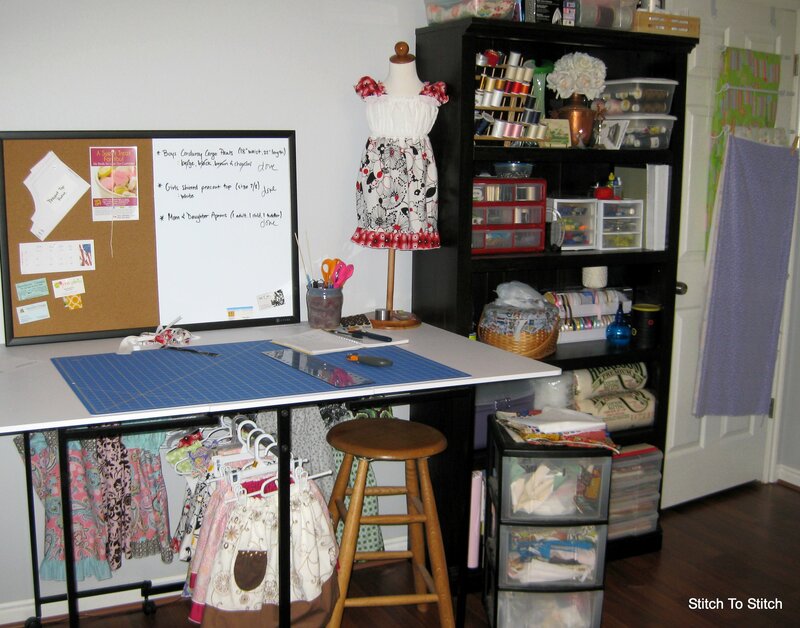 We had a designated “office” that was barely used for it’s intended purpose — mainly due to wireless internet on our laptops and my lack of a formal job anymore — so it was decided that the office would become my new sewing studio. At some time too we’d build a murphy bed in there to house our guest bed. The transformation is still a work in progress but so far, it’s been a fantastic change! It’s so much easier for me to sew and work on projects in the bigger space. I actually can stretch out and not have to worry about digging through drawers and bins to find what I need. And the best part! We took the outdated, unused desktop computer down and I’m using the l-shaped desk for my sewing desk! 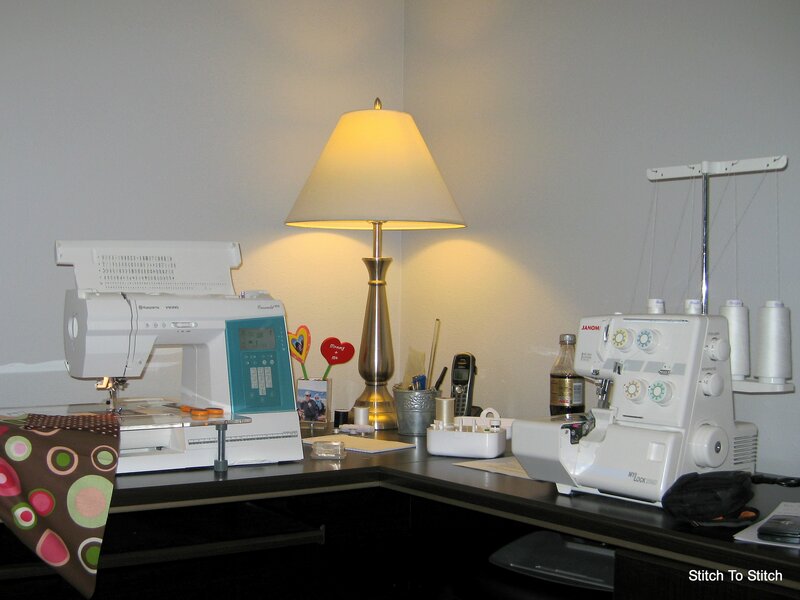 Ahhh…it’s fabulous to be able to swivel between my sewing machine and serger instantaneously. The desk also has a pull out piece for a keyboard that fits my laptop perfectly. That way I can have my laptop right there, yet out of the way, if I need to check on something written in a pattern or reference the internet when I’m having sewing problems. The book case that used to house all my reference books from college and office supplies is now used for sewing supplies. I actually have space to leave my cutting table open all the time and I snagged an unused 3-drawer (rolling!) organizer from the garage for fabric scraps. The shelf that used to overflow in the corner of the guest room was stained a darker color to match the sewing room furniture and is now my shipping/office supply center. (This is what I was organizing when my water broke!) 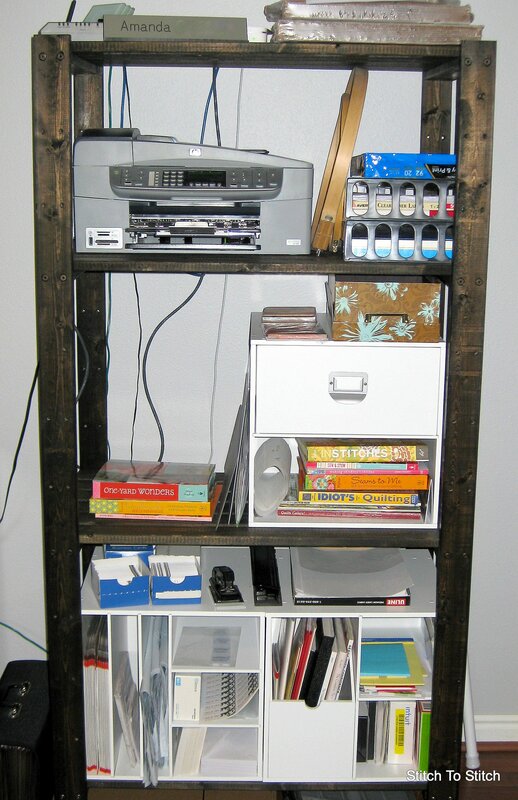 I need to find a way to mask some of the cords — maybe a piece of fabric attached to the back of the shelving unit. But this! This is my eyesore and the area that needs the most work! 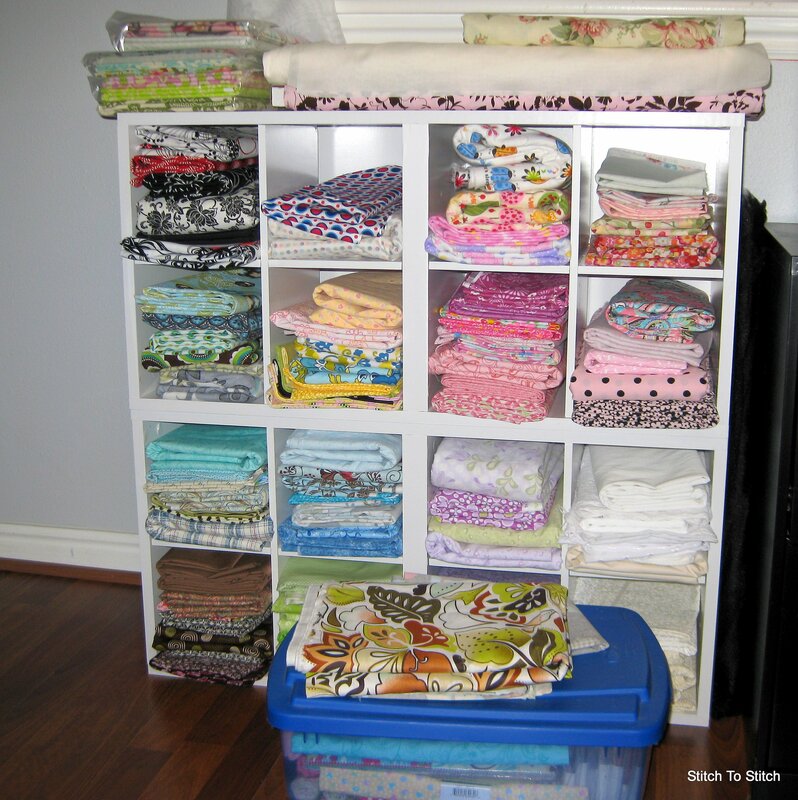 The large bins of fabric from projects-past, the containers of unfinished projects and the miscellany still need a home. I’m debating buying a 48″ wardrobe to house everything. The hangup is that my vehicle isn’t large enough to put a piece of furniture that size in (even if it’s unassembled) so I need hubby to bring it home. However hubby isn’t on my business accounts so I need to pay for it. Getting to the home improvement store with all 4 of us in one vehicle just hasn’t happened yet. Plus that would force me to actually take the time to sort through and organize that entire pile of stuff. 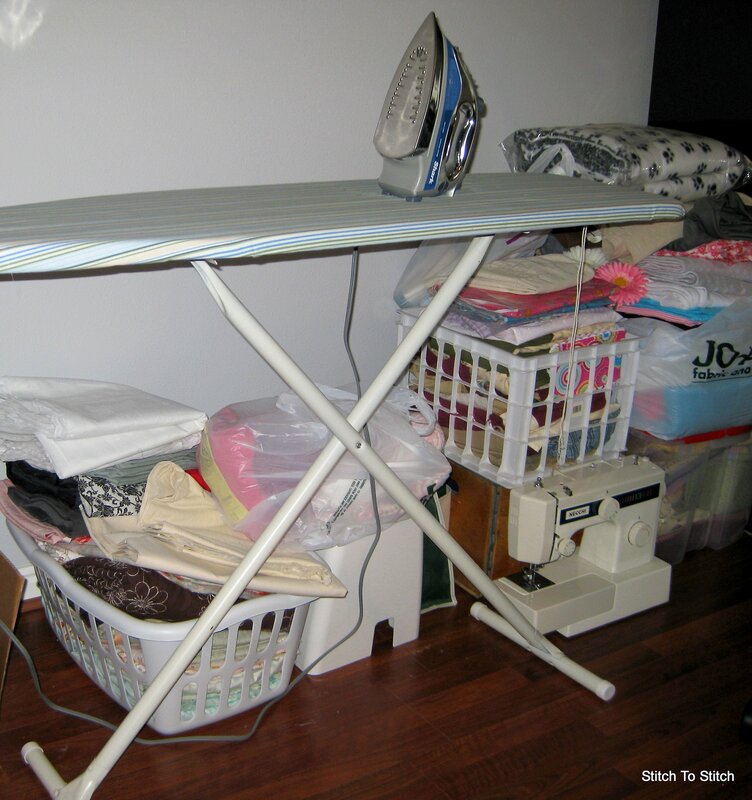 Although it is another great benefit to have an iron and ironing board right in my sewing area. Before I just used the one in our bedroom so I was constantly running back/forth across the house to press fabric and seams. It’s amazing how much more efficient I am in this space, even if my sewing time has decreased drastically for the time being.